Thursday represented a historic day for golf as Fox Sports offered live coverage for their first major championship at the 2015 US Open. There were plenty of questions and plenty of unknowns for how Fox would handle golf heading into the event at Chambers Bay. We all know Fox’s history in pushing the envelope when it comes to live sports, even venturing into a universe of their own on many occasions (examples: the glow puck, Scooter, Cleatus the Robot, and Gus Johnson announcing Champions League soccer). When the graphics did appear, they looked pretty sharp. When we first heard about Fox winning US Open rights, we joked that the choice for their lead announcer would of course be Joe Buck… because who else? With the Gus Johnson Soccer Experiment failing, the network really didn’t have anywhere else to turn. And I’ve done a 180 as much as anyone on Buck as his work has really resonated with me more in the last few years so I was looking forward to seeing what he and Greg Norman could do together in the brand new 18th tower. Of course the chemistry wasn’t going to be there on the first day, but I’m hopeful this can be a pretty solid partnership over the next few years. 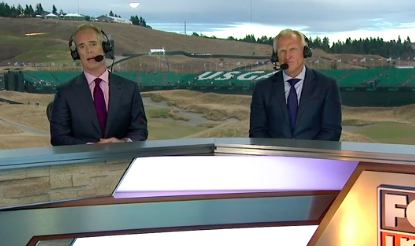 Buck isn’t going to have quite the gravitas of a Jim Nantz or the experience of Dan Hicks, but he has the perfect temperament for a golf telecast and the skill to play traffic cop amongst the different holes and announcers. His sardonic sense of humor can be a nice change of pace too as long as it doesn’t turn into another audition for Joe Buck Live. Buck began the broadcast with “We’ve dropped out of a tree onto your TV,” which was a veiled shot at NBC’s Johnny Miller who bitterly complained when Fox was awarded the U.S. Open rights two years ago. Norman was one of the strengths of the telecast, showing a willingness to call out players for questionable shots, but also praising them for good ones. In other words, Johnny Miller with a bit softer edge and without the constant references to shooting a 63 at Oakmont. He also added some tidbits that viewers didn’t know about (like saying how Angel Cabrera knew more English than he let on) With experience and time, this could be a fruitful partnership for Fox. Otherwise, this crew needs time to gel..
One of the things I learned going behind the scenes at the Presidents Cup with NBC’s golf crew was just how instinctual televised golf is to put together. That’s not just the case in deciding which shots to show on live and on tape. It’s particularly the case with the on-course reporters, who have to communicate with the broadcast booth and the production truck and know when to jump in and out of the telecast by a sixth sense, even though they’re a mile away. For a group that’s been doing it for years, this nearly impossible skill comes off seamlessly. For a group that’s never worked together, there are some significant bumps in the road. The transitions between on-course and hole announcers and tower were a little rough from time to time, but that should come together with experience. With that in mind, it’s tough to give a grade to any single announcer, although most of the cast seems passable. If anything, Fox’s debut today should give the average viewer just that much more respect and appreciation for how difficult a job it truly is. In his post-round interview, Phil Mickelson hugged interviewer Holly Sonders. Let’s just say he’s never shared that intimate of a moment with Roger Maltbie. – Fox is high on cross-promoting a lot of their network talent, but they might be smart to not rely so much on it moving forward. The social media reviews for Curt Menefee and Charles Davis were particularly rough. – One area where Fox can push golf coverage forward is clearly through technology. Some of the camera angles from the drones were awesome. Increased usage of shot tracer and contour maps for the greens drew the biggest praise for Fox’s coverage. Fox sports golf coverage is great. Lots of visual aids for greens and ball flight. – The easiest way to win over golf fans? Show more golf shots. The more Fox can stay out of the studio and on the course, the better. You can’t ask for much more than marathon coverage today almost from dawn till dusk. – Fox’s online channels including its U.S. Open 360 panel discussion led by Joel Klatt with analysts Joe Ogilvie, Morgan Pressel and EA Tischler won praise from viewers for their candor, ability to be interactive and for their instant analysis on replays. Overall, the feedback for Fox’s first day of major championship golf coverage was not very pretty, especially after a quick social media scan. Quite honestly, this was to be expected. However, after seeing the pieces of coverage that I saw today, I’m a bit more optimistic we’ll see some improvements throughout the week and this could turn out to be a positive for the sport. Fox held true to their promise not to completely reinvent the wheel – no Cleatus holograms, no fireballs shooting out of the hole for made putts, no endless crowd or band shots. For all the curiosity about how Fox would do golf, 98% of this looked, sounded, and felt like a normal golf telecast. And there’s enough here with the new innovations to tell golf fans to be patient while the network works out the kinks. The first day of coverage showed golf fans that this does have the potential to work out once Fox gets some more tournaments under their belt. At least, that should be the hope for everyone involved considering there’s going to be another decade of US Open golf on Fox. Pingback: Can Fox ever get some love from golf fans?